It was announced that more than $1 trillion has been added to the value of American equities since the stock market hit a two-month low on August 7th. Americans’ wealth has reached a record high, thanks to a surge in the value of stocks and homes. I’m sorry to be the bearer of bad news, but here’s a news flash: You haven’t made a penny in the stock OR real estate market! Just like those glowing reports about how much Americans’ wealth had ballooned prior to the last financial crash, the new reports are pure fiction. Until you sell your assets and lock in your (hopefully) gains, you have nothing more than a bunch of eye-popping numbers on paper. Those numbers repeatedly sucker many of us into believing we have real wealth and financial security when we do not. And didn’t we all feel like we were sitting real pretty again right before the financial crash of 2008? Then we discovered for the zillionth time that what goes up fast usually comes down fast, too. The stock and real estate markets did just that with a resounding thud. These collapses took the retirement security of millions of Americans with them. All our prosperity went unrealized. 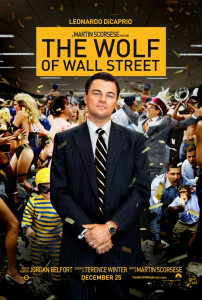 The Oscar-nominated movie that came out earlier this year, The Wolf of Wall Street, has the most profound ten-second scene about the truth about Wall Street. This blog post spills the beans. We see the same principle in our home values: The rise in a home’s value is only an unrealized paper gain – and it may vanish just when you really need the money. During the real estate boom years, we got some astonishing appraisals. I remember when our neighbors put their home up for sale. It had been appraised for nearly 50% more than our last appraisal, even though it was about the same size as ours and had nearly identical features. Three months later, we ran into their real estate agent who told us no one had even looked at the house, let alone made an offer on it. Two years later, the bank foreclosed on it. Buy it here for the lowest price available. 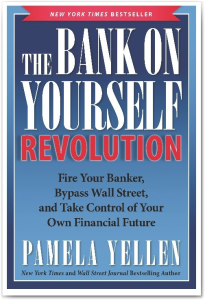 I’ve been surveying thousands of people since the publication of my latest New York Times best-selling book, The Bank On Yourself Revolution. Buy it here for the lowest price available. I’ve been asking people if they believe there will be another major stock market crash in the next five to ten years? Even I was a bit surprised to discover that almost every single person believes that’s going to happen! I’ll bet you can guess the answer. Almost everyone was rolling the dice in the Wall Street Casino with a major portion of their nest-egg. How much financial peace of mind do you think that provides? Hey, I’m all for optimism. In fact, my husband Larry sometimes calls me “Pollyanna” because I’m always trying to look on the bright side of things. 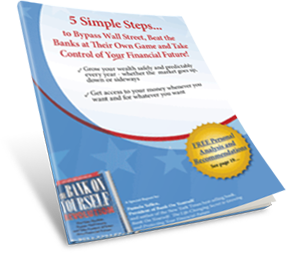 The Bank On Yourself method is based on an asset that has grown in value every single year for more than 160 years. The value of your plan is guaranteed to grow by a larger dollar amount every year you have it. (So you can sleep like a baby when the next crash happens.) What other financial asset do you own that does that? It’s easy to find out how big your nest-egg could grow – guaranteed – if you added Bank On Yourself to your financial plan. And there’s no cost or obligation to find out. Just request your FREE Analysis, if you haven’t already. You have nothing to lose and a world of financial peace of mind to gain!